Canadian Ecotoxicity Workshop – Poster Prize Winner! 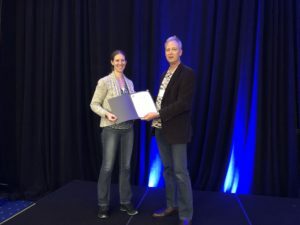 We are delighted to announce the winner of the Canadian Ecotoxicity Workshop that took place in Vancouver from 30th September – 3rd October 2018. The best poster was awarded to Jordana Van Geest of Golder Associates with her poster title: “A sulfite and total dissolved solids (TDS) toxicity interaction study for coal mine influenced waters in British Columbia.” The award was presented by Curtis Eickhoff at the annual general meeting luncheon that took place on Wednesday 3rd October. On behalf of the Royal Society of Chemistry, we would like to congratulate Jordana on this outstanding achievement. 27th Symposium on Environmental Chemistry Prize Winners! 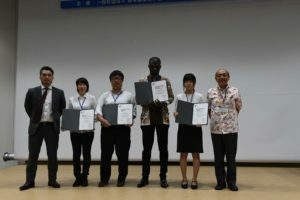 The 27th Symposium on Environmental Chemistry was held in Naha, Japan between 22-25 May 2018. The conference was chaired by Professor Kiwao Kadokami and was comprised of a number of plenary lectures, talks and posters on topics covering the breadth of environmental chemistry. 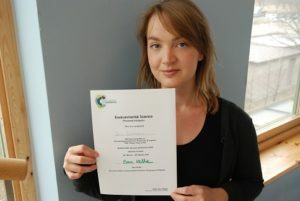 On behalf of the Environmental Science Journals, we would like to congratulate the following prize winners for contributing their outstanding posters. Congratulations once again to all awardees! We are delighted to announce the winner of the NOSA Early Career Scientist Aerosologist Award 2018. Jana Johansson (pictured below) from Stockholm University has been awarded the prize for the best Ph.D. thesis of 2017 by the Nordic Society for Aerosol Research (NOSA). “During my time as a PhD student I noticed that there is quite a big divide between contaminant scientists and aerosol scientists. As a result, our view of the atmospheric transport of pollutants is sometimes overly simplistic. To address some of the questions which have remained unanswered in my field during the last decade, I collaborated with scientists from the atmospheric aerosol unit of the Department of Environmental Science and Analytical Chemistry (Stockholm University). Receiving recognition from the aerosol community has encouraged me to continue this work as part of my post doc”, says Jana Johansson. Congratulations to Jana on this outstanding achievement. We wish her all the best with her future research on sea spray aerosols.